Bit of a different post today but hey, lets just go with it. I’m a big lover of board games, jigsaws and puzzles but my family haven’t really been that interested in them over the years. On the very rare occasion the Monopoly board would come out or “The Game Of Life” if anyone else remembers that?! I adored that game, with the cars as counters and putting little blue or pink pins in when you landed on a ‘have a baby’ square. I was introduced to a whole new world of games when I got with Jake. His family are much more into them and although I’m not too great at it, I’m an avid Articulate fan now. 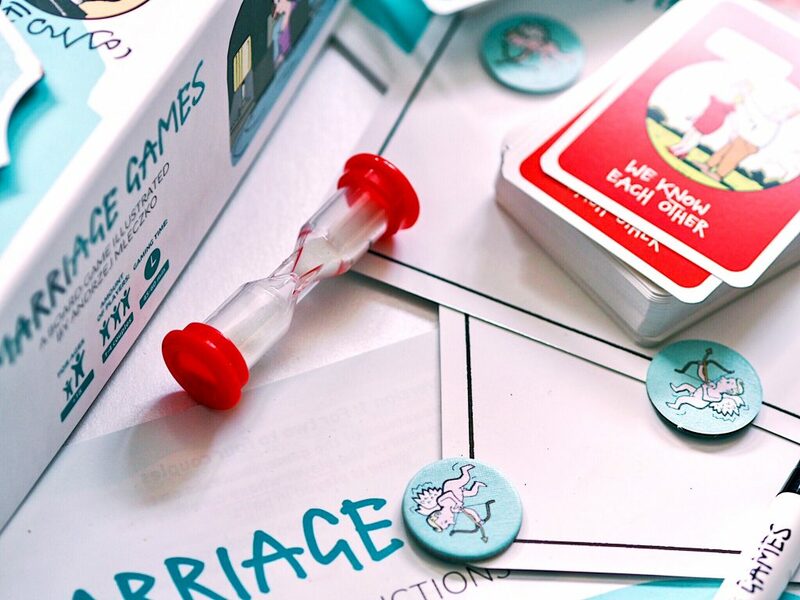 MDR Games sent over their creation “Marriage Games” which is solely aimed at couples. You can play it just the two of you on one side of the board or up to 4 couples can play on the other side. I must warn you, this is an 18+ game and I have included a few odd photos. Please don’t read on if you don’t want to see those! As life is a bit busy, Jake and I rarely get to meet up with other couples let alone sit down and play a game with them. If I waited for that day I probably wouldn’t have been posting this review for another 6 odd months so I’ll just be reviewing the one on one side of the board! The person at the end of the game with the most cupid counters is the winner. So to get these cupid counters, you have to win your round. 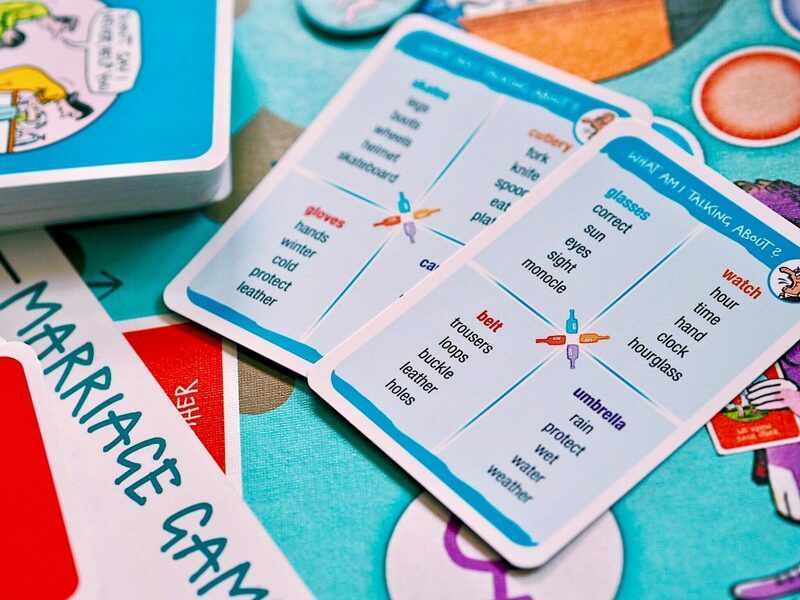 On the board, there are 10 spaces to move forward for each player and each space has a colour correlating to one of the sets of cards. Some of the spaces have a spin icon on, so you have to use the spinner to determine which set of cards you will play from for that round. You also get a whiteboard and pen each to use for this game. This is more like pictionary than charades but we’ll just go with it. The person who’s go it is not, has to pick one of the options on the card to draw for the other to guess. You get 60 seconds and there are multiple categories throughout the cards. 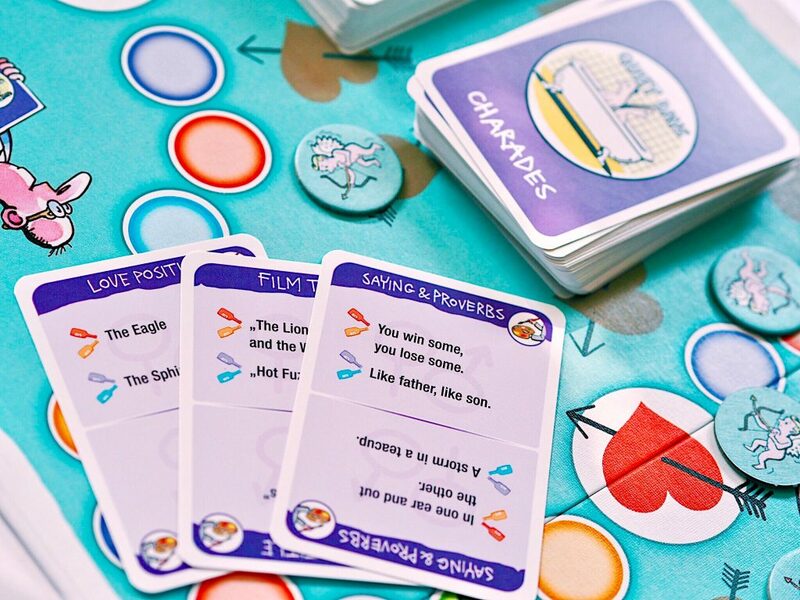 The categories are sayings and proverbs, film titles and love positions. This is quite a fun round and if the person guesses the drawing correctly, they get a cupid counter. I feel like these cards are a tad too easy. 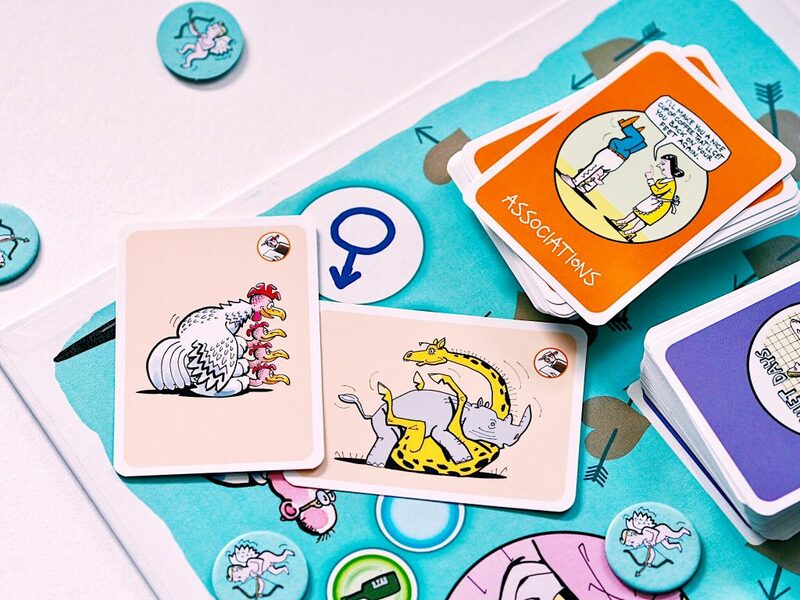 The person who’s go it is not has to pick up a card and describe one of the words/objects on it. You get 4 different options and then underneath those options are 5 words you cannot use in your description. If you guess it correctly, you get a cupid counter. This is the round where you find out how well you supposedly know each other. Some of the questions are incredibly easily and some a bit trivial, The person who’s go it is not asks the other one of the questions on the card. There are two questions for each gender to choose from (although I’m not quite sure why the gender thing was necessary?). You then both have to write the answer on the whiteboards so you can’t cheat and change your mind. If your answers match, the person who’s go it was, gets a cupid counter. 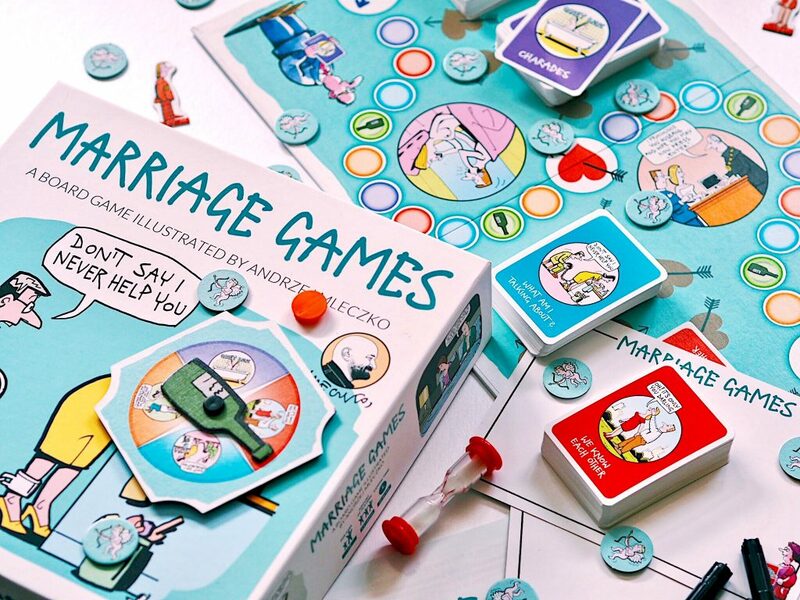 Once you’ve got the gist of Marriage Games and how it works, it’s a really easy and quick game to play. It took Jake and I around 20 minutes to get through it. To be fair to the game, it did keep us laughing all the way through although sometimes maybe not for the right reasons. The pure confusion some of the cards gave us just ended in hilarious situations. 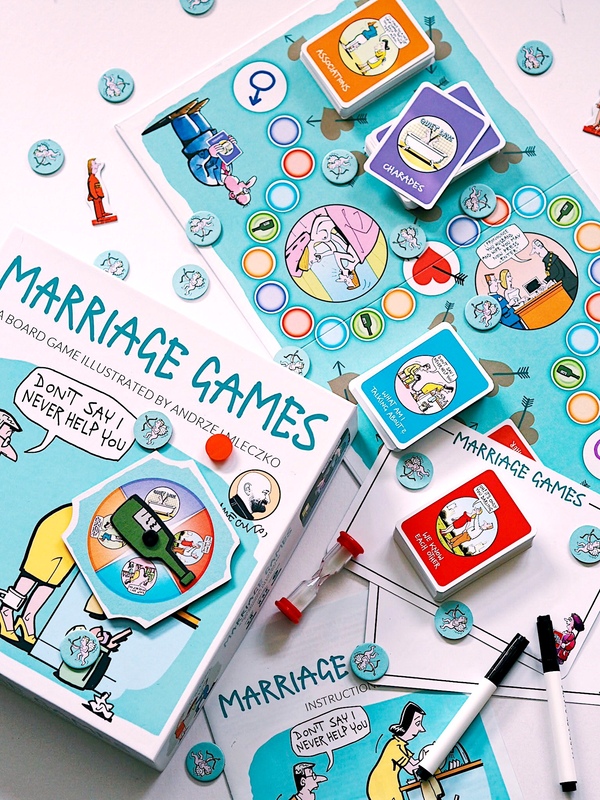 We came to the conclusion that Marriage Games would be more suitable for an older generation. It’s still quite fun to play for us but we feel the elements, the humour and some of the language used in it are just a little too outdated. We did also wonder whether some of the cards were references to things that we didn’t know about because of our age. All in all, it’s enjoyable and a fun thing to whack out when you’re bored! 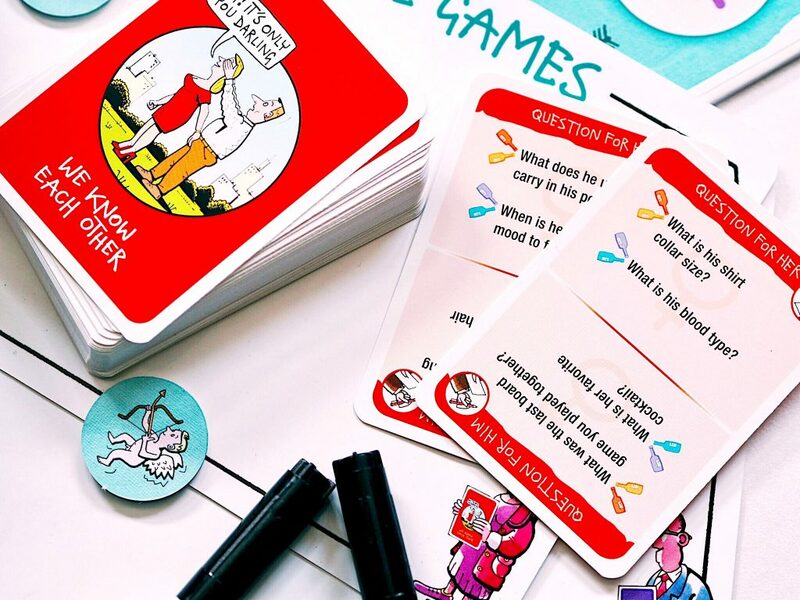 Do you have a favourite board game to play or do you think they’re dying out because of technology? "My Worst and Weirdest Customer Service Experiences!" "Festival Ready With Revolution & The Hot Pursuit Palette!" This literally sounds like such a laugh! would love to play this with the bf! !